Successfully Added 720p IP Security Dome Camera "Rogue II" - 1/3 CMOS Sensor, 30m IR Night Vision, Motion Detection to your Shopping Cart. 720p IP Security Dome Camera with 1/3 CMOS Sensor, 30m IR Night Vision, Motion Detection and more. Keep an eye on your property 24/7. 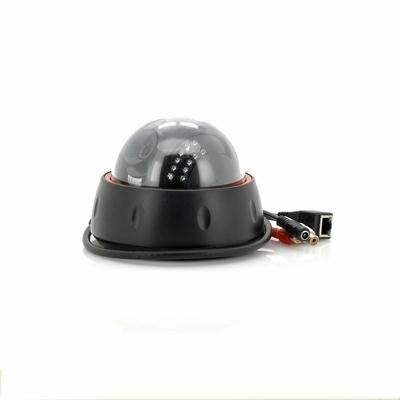 The “Rogue II” Dome IP Camera shoots 720p HD footage day and night thanks to its 1/3 Inch CMOS sensor and 22 IR LEDs with motion detection. Switching on the Infra Red lights automatically in low light conditions, the “Rogue II” delivers a 30 meter night vision range and a motion detection alarm can be programmed if desired. Furthermore, two-way audio support gives you the chance to not only hear what is happening but also to talk back if necessary. The “Rogue’s II” video feed can be accessed from any PC connected to the internet by simply logging in where you’ll be able to record, view and change video setting remotely. This way, you’ll always have an eye on your property, and if a PC is not around, you can connect to the video feed using your iPhone or Android Phone. This indoor camera is perfect for use at home, in an office, warehouse or any other place you need video security. Available at an astonishing low wholesale factory direct price, the "Rogue II" IP Camera with Night vision and Motion Detection Alarm is now in stock. Click "Add to Cart" and we guarantee to ship your order out within one working day. Brought to you by the leader in wholesale IP cameras and surveillance cameras, Chinavasion.